April 23, 2014 -- An ambulance equipped with a mobile CT scanner and thrombolysis equipment reduced treatment times for stroke patients without a corresponding increase in adverse events, according to a study published by German researchers in the Journal of the American Medical Association. Results from more than 1,000 stroke patients who received care while the program was in operation show that use of the specialized Stroke Emergency Mobile (STEMO) ambulance cut the average alarm-to-treatment period for patients with suspected stroke by about 25 minutes compared with usual care, and the researchers found no significant differences in seven-day mortality rates between the patients treated with thrombolysis in the ambulance and those taken to the hospital (JAMA, April 23/30, 2014, Vol. 311:16, pp. 1622-1631). "Although the current system is quite good -- we had 14 stroke centers in the catchment area -- and a high thrombolysis rate over 20%, with STEMO we were able to increase it to over 30%, and that's something that surprised me," lead author Dr. Martin Ebinger of Charité-Universitätsmedizin Berlin told AuntMinnie.com in an interview. "And thankfully, we were significantly faster than we expected and faster than regular care. The third reassuring thing was that the way of giving the treatment was safe." Time, of course, is brain when treating stroke. Neurons rapidly die off when blood flow is restricted in ischemic stroke, and multiple randomized trials have shown the time-dependent benefits of thrombolysis treatment with tissue plasminogen activator (tPA). Early treatment with clot-busting intravenous tPA medication is associated with better outcomes, the authors noted. "Within 90 minutes of symptom onset, the number needed to treat for 1 excellent outcome is 4.5; the number is 9 between 91 and 180 minutes and 14 between 181 and 270 minutes," wrote Ebinger, Drs. Benjamin Winter, Matthias Wendt, Joachim Weber, and colleagues, along with Dr. Heinrich Audebert, who designed the study for the STEMO consortium. Participating institutions included Charité, Vivantes-Klinikum, and the German Center for Cardiovascular Research, all in Berlin. Only a minority of ischemic stroke patients receive tPA, and in a recent European stroke registry study, only 11% of this group were treated within the first 90 minutes. The situation is no better in the U.S. Recent U.S. data show that most patients don't start getting treatment for more than an hour after they arrive at the hospital, the authors wrote, and fewer than one-third of patients start receiving therapy in less than an hour. Speeding things up is a persistent and thorny problem that has defied solutions. Enter the STEMO ambulance, a specially modified vehicle equipped with an 800-kg CT scanner (CereTom, NeuroLogica; adaptation and integration by Meytec), as well as a telemedicine connection and a point-of-care laboratory. 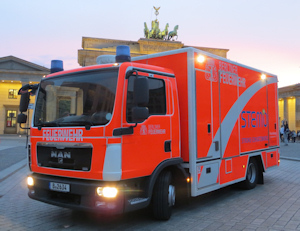 After a three-month pilot study to establish feasibility, technical reliability, and safety, the Berlin research team sought to learn more about the overall effects and risks of a specialized mobile stroke ambulance, launching the Pre-Hospital Acute Neurological Treatment and Optimization of Medical Care in Stroke Study (PHANTOM-S). When STEMO was deployed to the site of an emergency call, ischemic stroke was confirmed with blood tests and CT images acquired and interpreted remotely. Then, if ischemic stroke was confirmed and contraindications excluded, thrombolysis was started in the ambulance before hospital transport, the authors explained. The onboard STEMO team included one of seven experienced neurologists, as well as a paramedic and a radiologic technologist. The STEMO ambulance is specially modified to carry a mobile CT scanner. Image courtesy of Dr. Martin Ebinger. After tPA therapy was started with the bolus containing 10% of the drug, an IV drip was initiated to administer the rest, then the ambulance finally moved and patients were transported to the nearest hospital with an adequately equipped stroke unit. Summary reports and CT images were saved on disk and given to hospital staff on arrival. To evaluate STEMO's effects on stroke care, the group compared outcome parameters of all patients treated while STEMO was operating (STEMO weeks) with the control weeks when the program was not in operation (control weeks). Even during STEMO's operating weeks, it was not available for all patients, so outcomes were also compared between patients for whom STEMO was actually deployed and patients during the control weeks. The main outcome measure was the time from alarm to thrombolytic treatment; secondary end points included in-hospital mortality for patients with and without confirmed stroke and also tPA treatment rates, the authors wrote. Safety measures included intracerebral hemorrhage (ICH) on imaging after tPA and mortality, compared between patients receiving STEMO treatment and those receiving conventional care. The study was conducted between 2011 and 2013 and included 6,182 adult patients, divided into outcomes during STEMO weeks, control weeks, and following STEMO deployment, and finally through handing off the patients to one of 14 local stroke centers. The study catchment area included about 1.3 million inhabitants determined as being usually within 16 minutes of travel for an emergency vehicle from its base location, the authors wrote. To be deployed, symptom onset had to either be within four hours or unknown. Excluded were pregnant patients or those younger than 18 years, and only dispatch calls received between 7:00 a.m. and 11:00 p.m. were eligible. If a call was received during a control week or outside of operating hours, or STEMO was busy with another call, patients received routine care. Over the 21-month study period ending January 31, 2013, the control center received 7,098 STEMO dispatch calls, according to the authors. Data for 6,182 patients were analyzed using inpatient information from 28 hospitals. STEMO couldn't be deployed for almost half of the patients (n = 1,409, 44%) during the operation period because it was already dispatched to other patients (n = 1,288 patients) or undergoing service and maintenance (n = 139 patients), they wrote. When STEMO was deployed, the average alarm-to-treatment time was 25 minutes less than during the control period, the researchers reported. The percentage of patients treated within 90 minutes of symptom onset was 58% after STEMO deployment, 48% overall during the STEMO period (p < 0.001), and 37% during the control period (p = 0.02), they wrote. In addition, the rate of tPA treatment for ischemic stroke patients was higher after STEMO deployment (200 of 614 patients, 32.6%) than during the control period (220 of 1,041 patients, 21%, p < 0.001). Finally, use of the STEMO ambulance was not associated with either an increased risk of intracerebral hemorrhage or seven-day mortality. This remained true both across the entire cohort and in the subgroups of patients with a cerebrovascular diagnosis (2.3% during control period, 2.9% during STEMO period [p = 0.33], and 2.9% after STEMO deployment [p = 0.31]). In all, 349 of the 1,804 STEMO deployments were cancelled before the ambulance arrived -- and six of these patients received tPA in the hospital. A total of 1,455 received treatment in the ambulance. Seventeen were examined in the ambulance but didn't receive tPA until they arrived at the hospital, for reasons that included high blood pressure in one patient and agitation precluding CT in two others, and thus were deemed not eligible for tPA by STEMO physicians -- decisions that were overridden by hospital physicians on arrival. And there were eight patients whose symptoms changed for the worse who were eventually treated. "Our study showed that the ambulance-based thrombolysis was safe, reduced alarm-to-treatment time, and increased thrombolysis rates," the researchers wrote. "Further studies are needed to assess the effects on clinical outcomes." Enough data on clinical outcomes are probably available to do that study without more patients, Ebinger said, but German law is quite strict with regard to patient privacy and doesn't allow patients to be approached for research after a study is completed. So the current study wasn't powered to assess outcomes -- fast and safe was thought to be good enough, he said. 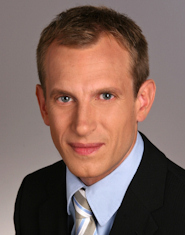 Ebinger and colleagues hope to perform "an even bigger trial, a multicenter trial with more countries involved in order to convince even the most critical decision-makers that this really pays off," he said. Much of the skepticism revolves around the need for a highly skilled ambulance team, he said. There aren't enough neurologists as it is, and people complain that it's too expensive and a waste of skilled staff. The authors note that going forward, the effects found in this study have to be weighed against costs of the STEMO concept. Depending on the configuration of the vehicle, a single STEMO ambulance costs about $1.4 million. Cost-effectiveness analyses are currently underway, they stated. But with so many patients turned away in the 1.3-million-population catchment center (44% in the current study), there is "absolutely" need of another ambulance, according to Ebinger. "This approach doesn't make sense for every kind of disease -- only where you could treat the patient in the prehospital setting and every minute counts -- and stroke is exactly that kind of disease," he said. "That's why in the end it pays to take that extra step and bring it out of the hospital and to the patient."